The newest sensation in birthday parties. Tired of the same old party then Skill Zone is the place for you. Party Package – 2 hours in duration – available Sun-Fri inclusive. 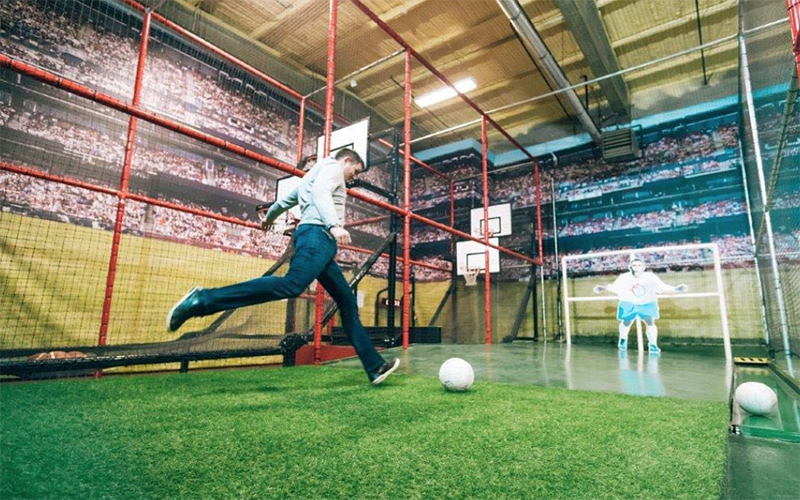 Skill Zone is Dublin’s first multi-sport indoor circuit. Incorporating 10 different sports including a 6m Racing Wall, Batting Cages, Rugby, Soccer, Tennis, Golf Chipping, Target Practice, Hang Tough, Gaelic and Basketball. Located in our 16,000sq.ft state of the art facility. When you come to Skill Zone be prepared to test your skills against the best. Challenge your friends or come alone and try to make the top 10 leaderboard. All participants must be over the age of 10 to complete the circuit. 1-12 ATTEMPTS -THE BEST SCORE WINS! 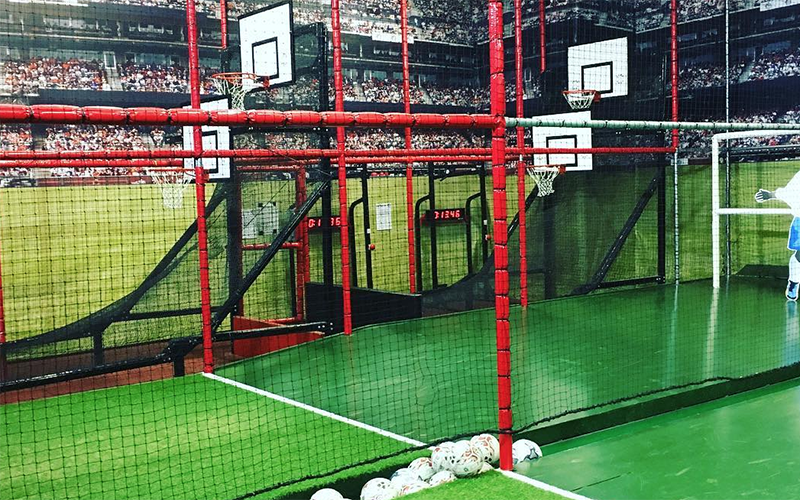 1-12 attempts at each sport – best score wins. Each circuit lasts up to 90 minutes!! Come alone and challenge for the Skill Zone top 10 scoreboard or come with your friends and challenge each other. 100 points is the max score!! How far up the leaderboard will you get?? We have installed two fully automated pitching machines. Softballs will travel at 50+mph and all you have to do is ‘swing away’. Ever wanted to feel the pressure of being an NBA basketball star?? You have 10 shots from 4.6 meters just like the pros!! Compete against the clock or your friends. This transparent 6m high wall with a stop clock built in allows participants to scale the wall with their opponent fully visible on the other side. True Blue technology provides the safety harness that allows for a safe descent when you have reached the buzzer. Out of your hands or from the ground either way you have 10 attempts to get it between the sticks like any given Sunday in September. Can you chip a ball into the hole from 9 yards?? Now is your chance!! How long can you hang for?? Against the clock, last man hanging wins!! 3+ Minutes and the 10 points are yours!! Drop goal or place kick the choice is yours but the target is the same. 8 attempts to stick the ball between the posts. Feel the pressure of a penalty shootout. 10 penalties, 4 targets, 12 yards. Ever wondered if you could return Roger Federer’s serve?? Well now is your chance. Another heavy-duty automated serving machine fires the tennis balls at 50+mph and all you have to do is return with interest!! The newest sensation in birthday parties. Tired of the same old party then Skill Zone is the place for you. We will allocate a party host to look after the party. They will divide the group in to teams, explain the rules, bring them around the circuit and help keep track of the scores. All participants must be over the age of 10 to participate. The newest location for stag/hen parties. When you come to Skill Zone we will look after you from the minute you arrive. We will allocate a host to look after your group, split you into teams and help you with the scoring. For groups of 8+, food options are available from €8 per person subject to availability. Cost – €20 per person (Fri & Sat) Food options start from €28 per person. Looking for something completely different for your school/sports group then Skill Zone is the place for you. Groups of 15+ can experience the fun and challenge of the 10 sports. Packages start from €20 per person Monday to Sunday. Food options are available from €8 additional per person. Skill Zone is the newest sensation in corporate entertainment. Are you looking for a great way to stimulate your employees? If so, why not take them out of the office and visit us in Skill Zone Sandyford for an exciting experience that will challenge, motivate and help build team dynamics. All concerned will get to experience something totally unique as they attempt to get the best score in each of the ten sports. Split into teams or run a solo competition, whichever you choose will definitely bond your group. When you book you will have the sole use of the facility for up to 90 minutes. We will allocate referees to keep score and do the prize giving at the end. Pricing starts from €900 for up to 40 players with all extra players over 40 charged at €20pp. With this booking, there will be other groups in the facility and you need a minimum of 15 participants. Pricing starts from €20 per person. Pizza (3 slices each)and soft drink can be provided in-house for €8 per person. Minimum 8 participants. We have also teamed up with The Beacon Hotel who have food options starting from €8pp for platters up to a BBQ in their private courtyard from €15pp (minimum 15 for BBQ). You will be allocated your own private area in the hotel to enjoy your food and drinks. Looking like rain for the weekend, why not try Skill Zone?! Be sure to pre- book to avoid disappointment!